It was a rough month for Phobos, as astronomers decreed—yet again—that Mars is ripping its lumpy moon apart. But apparently, Phobos’ loss is the Red Planet’s gain. After the satellite is torn to pieces, its fragments will fan out into a disk and 20 million years from now, Mars will become a ringed planet. That’s the conclusion of a UC Berkeley-led study published this week in Nature Geoscience, which takes Phobos’ violent demise to an unexpectedly beautiful conclusion. But this little moon’s fate is more than just a cosmic curiosity. Rather, the researchers argue that Phobos could be a window into the origin of ring systems throughout the Solar System and beyond. We’ve known for years that Phobos’ days are numbered. A mere 16 miles in diameter, the ruddy, cratered satellite is being reeled in by Mars’ gravity, which means eventually, Phobos should crash into the Red Planet. (In fact, Mars might have already killed another moon in exactly the same manner.) But recently, astronomers have come to suspect that Phobos could be broken up by Mars’ gravity long before a Deep Impact situation develops. Just as the tug of the Earth on the Moon manifests as tides, Mars’ gravitational pull leaves telltale traces on Phobos—a series of fractures across the moon’s surface. Earlier this month, a NASA-led study concluded that those fractures are the early signs of structural failure, and that 30 to 50 million years from now, miserable Phobos will be shredded to bits by this “tidal flexing.” Ben Black, lead author on the new Nature Geoscience paper, likens the dismemberment of Phobos to a giant pulling apart a granola bar, scattering crumbs and chunks everywhere. After modeling the break up of Phobos and coming up with their own estimate for the moon’s demise—10 to 20 million years from now—Black and his co-author Tushar Mittal wanted to find out what’ll happen next. Will Phobos’ remains rain down on the Red Planet in an apocalyptic meteorite shower? Or will the moon go out peacefully, its sundered fragments settling into stable orbits around Mars? Phobos’ Stickney crater (top) was created by an impact that could have torn the moon apart if it were a little more porous. Image Credit: NASA. A little bit of both, according to Black and Mittal’s new models. Large chunks of Phobos strong enough to resist gravitational breakup will eventually spiral in and collide with Mars in oblique, low-velocity impacts. “The size of any chunks that might crash into Mars is hard to predict,” Black told Gizmodo in an email. But: “We expect them to crash along the equator, so that is where any hazard would be concentrated.” Future Martian planners, take note. 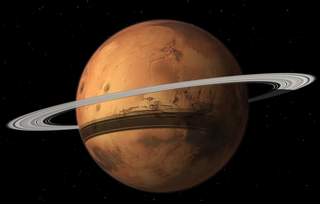 The rest of Phobos will fan out to form a planetary ring system. The exact lifespan of that ring will depend on how close Phobos is to Mars when it breaks apart, something astronomers aren’t yet sure of. If, however, Phobos breaks up further from Mars, the ring could persist for up to 100 million years. Either way, it won’t be much of a sight from Earth—while Saturn’s rings get their brilliant sheen from ice, Phobos is composed mainly of dark, carbon-rich rocks. But for anyone living on Mars tens of millions of years from now, the Phobos Ring will be a permanent fixture in the sky. In our Solar System alone, Saturn, Jupiter, Uranus and Neptune all have ring systems. According to Black, Phobos’ future fate offers one possible scenario for the evolution of planetary rings in the early Solar System, when astronomers suspect there were even more moons surrounding the gas giants. “We expect that inwardly migrating moons like Phobos should be a relatively common product of planet formation,” said Black. “So the same processes we describe for Phobos’ future could have occurred in the past in our Solar System.” In fact, it’s possible that all the ring systems in our Solar System include the shattered remnants of bygone moons. Who knows, maybe humanity’s second home will have its very own rings. Although given the 30 million-year forecast for Mars—cloudy with a chance of fiery, dismembered moon chunks—I’m honestly not sure how I feel about that possibility.